You're looking how to hold your monopod in a stable way. This posts gives you 2 ways. 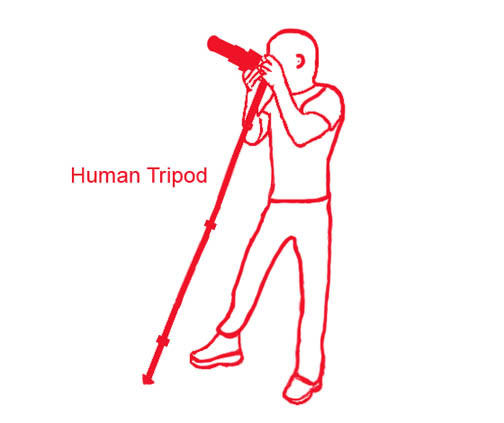 The first monopod stability tip is best imitated by copying what's this diagram shows. Hold your monopod this way and you'll make your monopod work almost as well as a tripod. Monopods do a great job of reducing motion blur compared to just steadying your camera using just your hands without support. Monopods can't duplicate the stability you get with a tripod, but you can add to the stability of your monopod. Your camera can move in a variety of directions when you squeeze the shutter button and take your photograph. Think about it. It can move front to back, side to side, up or down, tilt clockwise or counter-clockwise, rotate on its axis, or any combination of the above. Here are two ways to improve your monopod stability. Spread your feet to about the same width as your shoulders are wide. Place the bottom tip of your monopod in front of you to form a triangle with your feet., also at about the same distance as your shoulders. Lean forward slightly to put a small amount of pressure on your monopod. There's often a lot of opportunity to get blurry photos unless you are using flash or a high shutter speed. The monopod eliminates the up and down and quite a bit of other motions, but there is still a good chance you might have some leftover camera movement during exposure. There are also other ways to hold and use your monopod. There is another way to stabilize the monopod. Add a second point of contact to a solid stationary object. Now with the tip of the monopod and the secondary point, there is much less potential for camera movement. Rather than depend on just the one contact point, the bottom tip of the monopod on the ground, you can add a second point of contact. That could be a wall, a fence, or a tree. 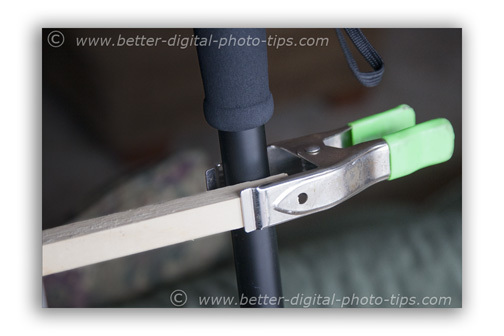 Using a large Alligator Clip, attach a 1 inch by 1 inch piece of trim board (or other solid,hard object) to the monopod leg and gently press the other end of that 1 x 1 against a solid, stationary object. 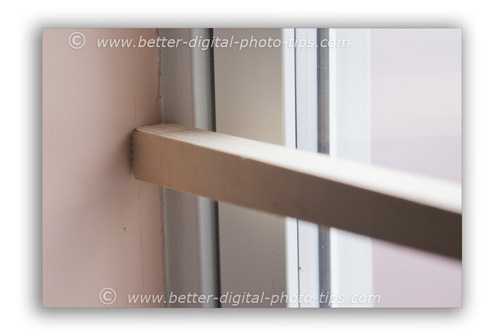 The photo below shows a window jam used as the secondary point of contact. This takes the stability of the monopod a big step closer to the stability you get when using a tripod. You still cannot let go of your camera with this stabilizer-bar method like you can with a three-legged tripod. Your monopod, stability bar and a clamp weigh int at a fraction of what a tripod weighs and they take up less space too. Here is my disclaimer: Using this technique will not give you the same degree of stability that you get by using a tripod. This monopod tip for added stability definitely does have limited uses, but there are situations where having this understanding help you avoid taking a blurry image. An additional technique to use to get great sharpness with your monopod is to use a remote shutter cord. Even the slightest pressure on your shutter button will have an impact on your camera's steadiness. By triggering you shutter with an electronic remote release, you are avoiding another cause of camera movement and can avoid the common photo mistakes of camera movement and blurry photos.